The cruise season is well underway and this great article, published in The Australian, rounds up all the cruise ship visits for 2010. 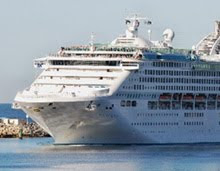 There are visits from Rhapsody of the Seas, which embarks on a two-stage circumnavigation of Australia from February 26; Volendam, with a 34-day circumnavigation of Australia from Sydney on March 14, and the Diamond Princess, which is operating Princess Cruises' annual trans-Tasman program until February 21. If you're looking for a great deal on cruises, head to http://cruisesaustralia.net.au and book ahead. The website always has discounted fares going, so to book your Cruise Australia go to http://cruisesaustralia.net.au.